SAVE $10 on your next massage for every referral that comes in for an hour or more. Please inform massage therapist for each individuals being referred. Super Summer Indulgence! - Have a truly relaxing massage with this month&apos;s promo! Get out of the Heat and Enjoy a Relaxing Massage! GIFT CERTIFICATES ARE AVAILABLE FOR EVERY SPECIAL OCCASION ALL YEAR ROUND! A massage is a gift that anyone can enjoy and appreciate! 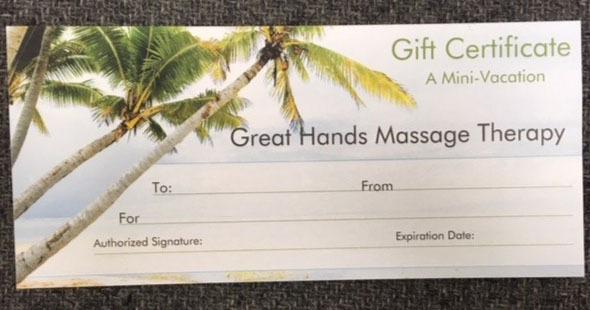 Gift certificates can also be mailed to clients if needed. Call to purchase a giftcard today!